Sometimes, in fact almost all of the time, the magic of motherhood can be lost somewhere between packing the lunches and shuttling to soccer. There is a fair amount of work required in rearing children, and by work I mean constant nagging. Make your bed, stop texting, feed your fish, stop texting, eat something green, stop... Honestly, I can hardly stand myself by the end of the day. I don’t know how they put up with me. But occasionally, something sweet and tender happens that is absolutely divine, and I want to freeze time. Generally, I feel these cute-kid stories are overdone, and therefore I shy away from them (but you can’t say I didn’t warn you with the title). My husband returned from a business trip yesterday. On the way to gymnastics the kids were musing about what little gift he would bring them. Yes, I wonder what he’s bringing me, I joked. My oldest daughter immediately picked up her phone to text him a warning that I was hoping for a present. I laughed, and told them I was kidding, I didn’t really want a present. My youngest daughter said solemnly, I’m going to make you a present anyway, Mummy. I told her a hug from her was all I wanted (my originality is not at its peak that time of the day). While I was making dinner, she was conspicuously absent, whereas usually she is underfoot. She finally emerged from her room with a piece of paper, laden with her writing. 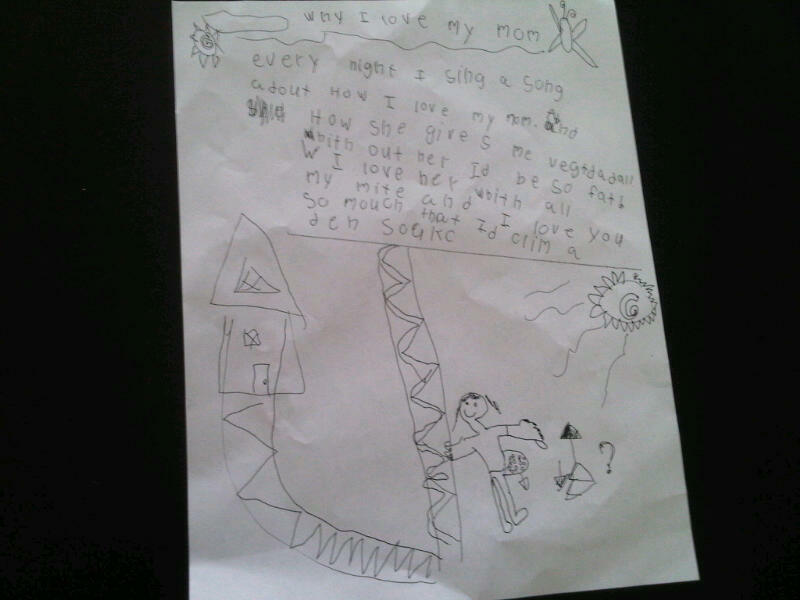 I flipped the paper over, and on the back she wrote a poem. whith out her Id be so fat! At the wise age of seven, she was perceptive enough to see through my rather pathetic ploy for recognition. Her gift made me speechless, which perhaps was the real goal – to dissuade me from nagging for an evening. Stop growing, stay little, I whisper to her when she’s asleep. This is absolutely precious! And the spelling makes it even more so. 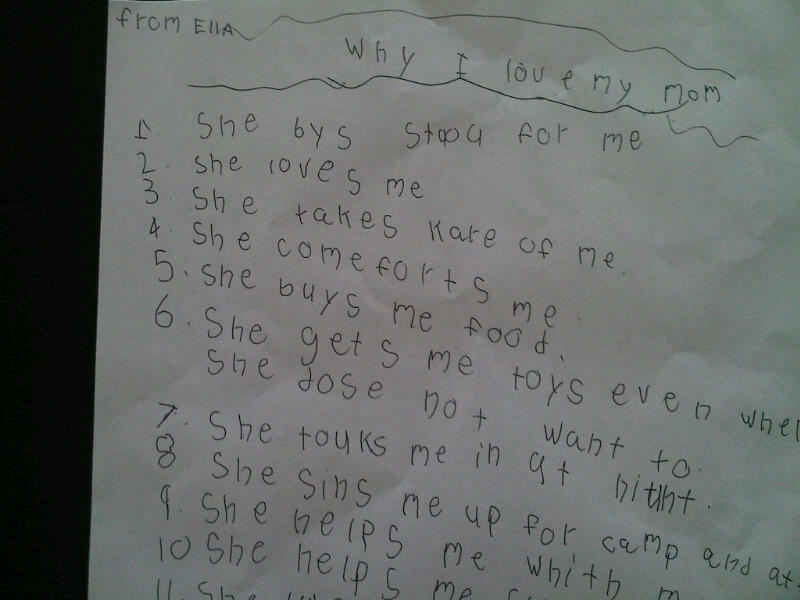 “She touks me in at niuht” is particularly creative. What a sweetie! Did your husband bring you a gift, by the way? It can’t have topped what Ella gave you, I bet. Her spelling kills me, I privately never want it to change…Thanks Kathy. Aw, thanks Barb – love right back atcha. Really hope to get to Toronto soon to meet PJ before he graduates from high school. I’m sure this note will make the “tickle truck” for sure! So sweet, I loved it! I will print it off for Mom to enjoy as well! That is so lovely! What a sweetie.